Key performance indicators are critical benchmarks. Whether you want raw data reports or more simple charts and graphs, Metis KPI reports always keep you up to date on your campaign progress. How do you know your marketing department is creating value for the company if you can’t measure your goals in hard numbers? Sampled data is deficient and a barrier to verifying your successes. You need thorough, accurate data to prove your department’s efforts are paying off. Any vendor can run a KPI report from incomplete data, but you’re left with incomplete results, which leads to poorly informed decisions. Read on to see where Metis KPI reports differ how they help you reach your campaign goals. Most reporting dashboards give you only partially processed or summarized data, and don’t allow you to control or access your full range of data. Their sluggish nature makes effective analysis and trend anticipation difficult. Marketers don’t want slow, generic dashboards made for generic data. 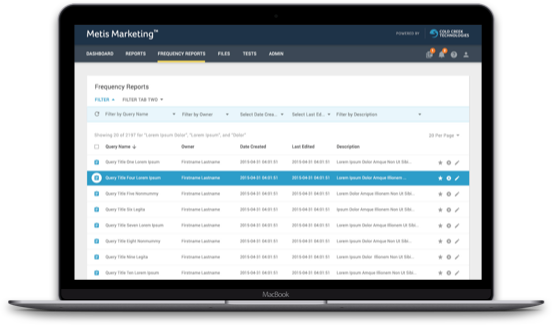 Metis KPI Reports help you organize and understand your data at a deeper level than other marketing reporting tools. We use proprietary Cold Creek technology to capture trillions of data points at the log file level, and then processes and prepare that data at 1000X the speed of equivalent platforms. 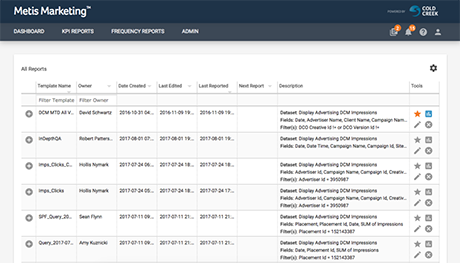 What you see in the dashboard is processed through Metis, gathered in real time from your ad server network digital media sources, at the time of report run. Every individual impression is processed, offering you true data visibility and transparency. Data accuracy and relevancy is further enhanced by two key Metis features – our proprietary pinpoint restatement technology and our data triangulation methodology. Take advantage of the data granularity and gain insights you simply can’t get with other vendors. 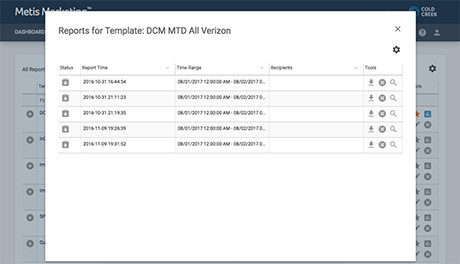 With our dashboard you can fully customize the look and feel of reports for a better user experience and easier analysis. Each report can be downloaded and distributed in your preferred formats. Restating data at the end of the month is common in online marketing. However, the majority of marketing dashboards don’t update to reflect the restated data from the ad server. You end up with data with omissions or errors. It’s impossible to effectively analyze data when the inputs are not accurate. Our Pinpoint Restatement Technology automatically rechecks all the data from ad servers and other digital data sources to guarantee data accuracy. Our technology systematically updates and reprocesses restated data and arranges it, so when your report generates, you can trust that the data you’re analyzing is the most up-to-date data available. 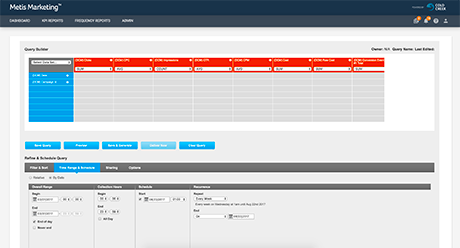 Pinpoint Restatement enables you to make split second decisions based on visible trends across your campaigns. You can be confident in your data inputs and focus on what’s important – making strategic decisions during live campaigns. Our data triangulation methodology uses several kinds of captured and compiled information to build bridges between systems where differences in reporting units make data analysis frustrating. We capture clicks using various tools such as our proprietary pixel, our routing engine, and by combing through log files using search management tools. Then we integrate and process reports from sources that provide data on a daily basis, including information like impressions and spending, for the campaigns tied to the captured clicks. Our technology makes educated assumptions, based on these data points, about what the hourly data should look like for the sources that only report on a daily basis. When you don’t have exact hourly data, you use well-sourced clues and deductive reasoning to find insight where none existed previously. The data triangulation methodology in Metis does just that. Our User Permissions and Data Access functionality ensures your data reaches the right shareholders inside and outside your organizations. You choose the users and what they’re permitted to access within the system. We’re serious about your user information and data security. Absolutely no sampling, ever. You always get the most complete, granular marketing data available. And it’s processed with care and rigor. Every time you log into your Metis dashboard, you see what’s happening at that moment.